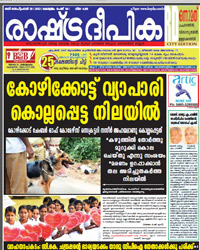 Desabhimani is a Malayalam newspaper and the organ of the Kerala State Committee of the Communist Party of India (Marxist). Started as a weekly in Kozhikode on September 6, 1942 and converted to a daily in 1946. Deshabhimani now has nine different printing centres: Kozhikode, Kochi, Thiruvananthapuram, Kannur, Kottayam, Trichur,Malappuram, Banglore and Bahrin. 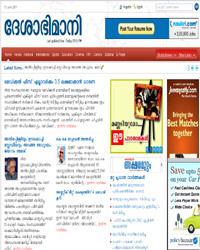 According to the National Readership Survey of 1995, Desabhimani was the third largest newspaper in Kerala. 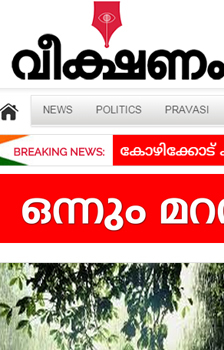 At present, V. V. Dakshinamoorthi, secretariat member of the CPI(M) is the Chief Editor of the paper and E.P. Jayarajan, CPI(M) central committee member, the General Manager.